I love my little Raspberry Pi computer, but wasn’t using it much because it only has HDMI and composite video out. The monitor on my desk doesn’t have HDMI, so I was looking for an HDMI-to-DVI converter. At the local flea market, I stumbled a lovely little adapter which I got for a dollar. It appeared to have a jack appropriate for an HDMI cable on one side, and the male side of a DVI plug on the other. My plan was to plug this into the monitor, then run a standard HDMI cable to the Raspberry. But when I got home, I found that the DVI end would not plug into my monitor. I couldn’t figure out why not, as it looked like there were 24 signal pins on both. 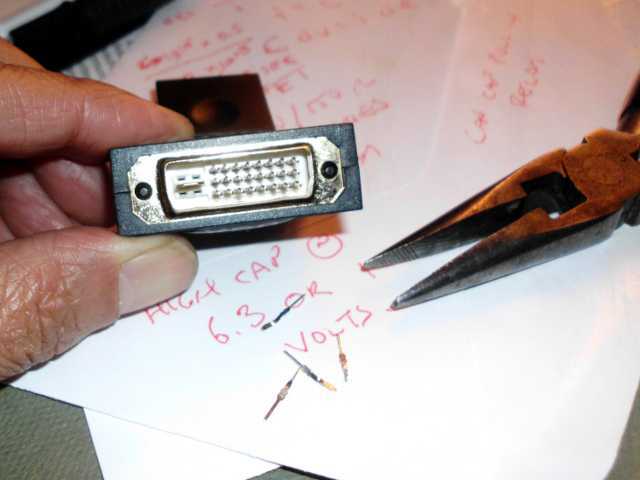 Then I noticed that there were actually 4 extra pins on the adapter around the spade contact. The internet said that these were analog pins, so I decided to take a chance and try to convert the adapter to fit into my monitor. Nothing to lose; even if I destroyed the adapter, it was already unusable in its present state. First, I removed the 4 analog pins around the spade contact. Others on the internet have either ground these down, or cut them off, but I found that I was able to simply pull them out with a needlenose pliers. 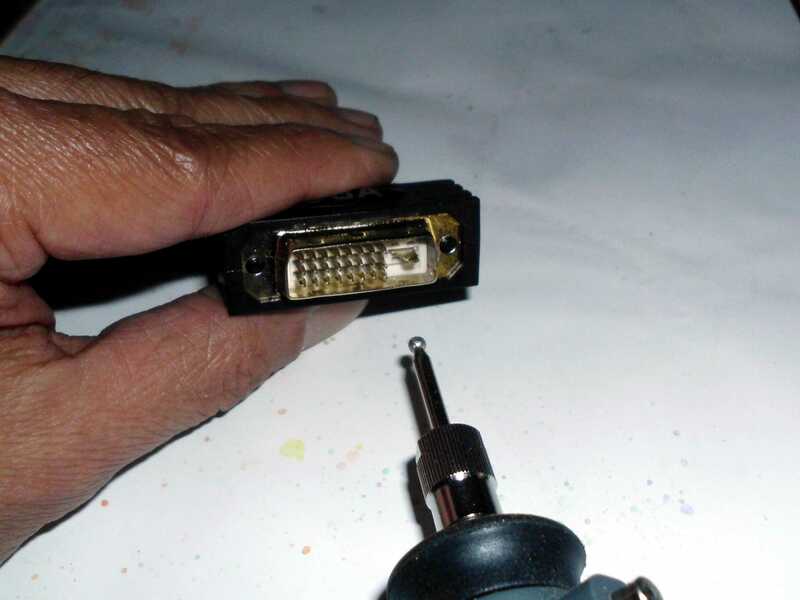 On the analog version of DVI, the spade contact is slightly wider than on the digital version. In other tutorials, people have simply cut this contact down with a diagonal cutter, but I found it neater to trim it to size with a rotary diamond burr.